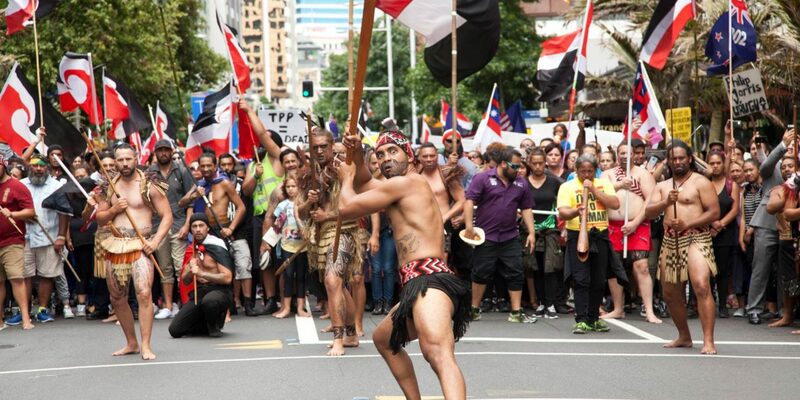 MANY OF OUR FINEST, Māori scholars, lawyers, and rights advocates have spoken out against the increasing number of free trade negotiations and agreements on our lands, and the resulting implications for us as Māori. Although the Trans Pacific Partnership Agreement (TPPA) has recently morphed into the Comprehensive and Progressive Agreement for Trans-Pacific Partnership (CPTPP), many of our concerns remain. Our overarching concern is the singular truth that, as sovereign people and Treaty partners, we expect to be present and negotiate directly in relation to international trade relationships, as well as any agreements that have scope to influence laws upon our lands, waters, and people. Consultation is not good enough, nor are state government provisions such as the exception clause, which I elaborate on below. We are Treaty partners and as such we expect direct negotiation from the outset on such issues. Both the TPPA and the CPTPP have failed on that front. One example of this failure are the provisions for the environment in the CPTPP – which largely deals with issues such as overfishing and wildlife trafficking – but do not address the increased biosecurity risks of free trade agreements, which are increasingly highlighted by environmentalists as a major biodiversity risk in Aotearoa as free trade has been highlighted as a source of plant viruses, and insect pests, from overseas. This, naturally, compounds the challenges for Māori who are under-resourced and overwhelmed with the challenges of maintaining our ancestral legacy for future generations. Investor State Dispute Settlement (ISDS) provisions are another anathema for any group pursuing Indigenous rights. That settler-colonial governments willingly sign into arrangements that would see an international tribunal determine culpability for infringing upon the rights of investors, is a direct insult to the ongoing struggle for these same rights to be accorded to the peoples upon whose land these governments have established themselves. The tribunal operates within the United Nations Centre for International Trade Related Arbitration Law (UNCITRAL) or at the International Court for the Settlement of Investment Disputes (ICSID) at the World Bank. The arbitration of this process has been heavily criticized for corporate bias, lack of transparency and conflicts of interest. Provided that such measures are not used as a means of arbitrary or unjustified discrimination against persons of the other Parties or as a disguised restriction on trade in goods, services, and investment, nothing in this Agreement shall preclude a Party from adopting or maintaining a measure it deems necessary to fulfill its legal obligations to Indigenous peoples. In general, exception clauses are intended to allay concerns around what these agreements might mean for Indigenous Peoples. 1. This clause was not developed alongside Māori. It was first included in the 2000 New Zealand trade agreement with Singapore. Māori have never offered our express consent for this clause as a measure of protection for our rights in a free trade agreement. Since 2000, we have always held the position that it is not strong enough to protect our rights within a free trade agreement. 2. It should be noted that the exclusion is only triggered if it does not “disguise restriction on trade in goods.” This part of the clause is very important. It is called the “chapeau” and it will influence the entire interpretation of the rest of the clause. This very important phrase is a significant loophole that could be exploited by any corporation to oppose an exception. Most Indigenous rights abuses relate to trade. If trade is prioritised over Indigenous rights in a trade agreement then the exception clause is effectively toothless. 3. With regard to “adopting or maintaining a measure it deems necessary to fulfill its legal obligation to Indigenous Peoples,” it is reasonable to assume that in this case it will be the government’s interpretation of its legal obligations to Indigenous Peoples, which rarely, if ever, aligns with Indigenous Peoples’ interpretation of state obligations. At a conceptual level, we object to foreign investors having enforceable rights that we, as the Indigenous People of Aotearoa, still do not have over our own territories, resources and intellectual property. It is impossible to predict how an ISDS tribunal may interpret the chapeau outlined in point 2 above. The exception clause is triggered when a government takes an action that will be in specific interest of Māori (for example, if government gave special grants to Māori owned businesses, and a foreign investor objected, then the government could call upon the exception clause). However, it does not cover areas that are not in specific relation to Māori, but will impact on Māori, incidentally (for instance, mining, fishing, public health). 5. The Tribunal found that although the exception clause was “likely” to offer “reasonable” protection for Māori – it did not accept the Crown’s claim that “nothing in the TPPA will prevent the Crown from meeting its Treaty obligations to Māori.” It therefore recommended continued discussions to improve protection. 6. The Tribunal was not convinced that the exception protects Crown actions from a dispute by a foreign investor, for example on water or mining. This would have disproportionate impacts upon Māori that would therefore not be subject to the exception clause. These agreements tend to be highly technical and inaccessible, and point to state officials eroding our rights as Indigenous peoples with the use of legal and economic jargon. But from Aotearoa to Indigenous territories in Canada, these are the tools being used to circumvent our participation in the governance of our own territories. As we scrutinize these agreements, we can also build solidarity, and challenge an international trade regime that would permit the theft of our lands.